Orders placed on weekends or holidays will ship the next business day. You can calculate the transit time of your package beginning on the day it ships. 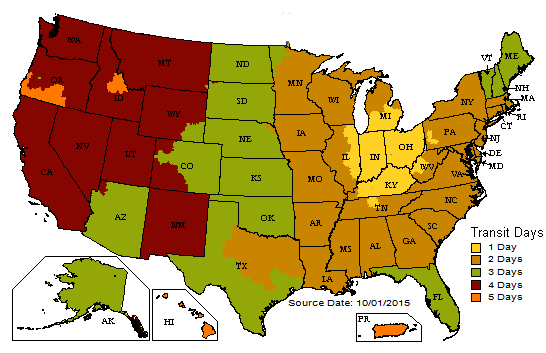 Below is a map showing estimated shipping time by ground. This option is less expensive, but is slower and does not offer tracking. You will be charged for international airmail shipping plus an additional $14 for international packaging, documentation and guaranteed delivery. Any customs duties and taxes will be due upon receipt of the package. Your package will arrive in an average of 10-14 business days.